Here we see PEOF and some examples of the sub frameworks it orchestrates and the categories they exist within. PEOF supplies a set of fundamentals that make the whole coherent and leaves the detailed execution of Operation to lower level frameworks such as eTOM and the Pragmatic Marketing framework,, etc. 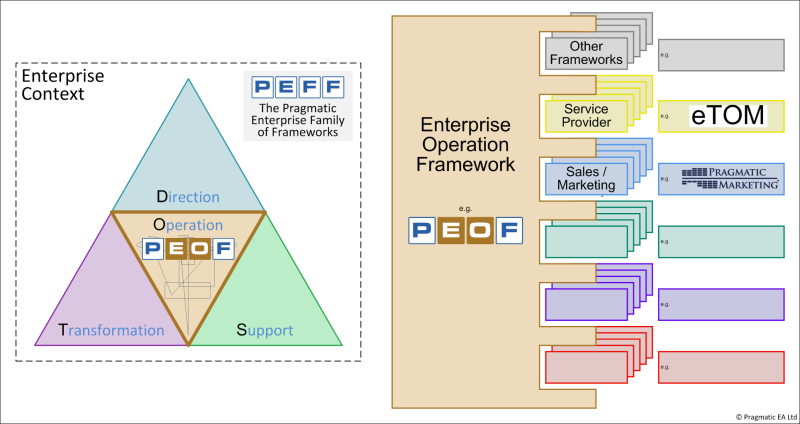 PEOF allows Enterprises to optimise the whole of Operation. This may in fact, require the sub-optimisation of some or all of the parts!